Rain resumes on the Western front and it is not a shower but a steady soaking downpour. Haig however, encouraged by recent success, ignores the rain and decides to make a further attempt to break the Germans on the Ridge. He orders the Anzacs to take Passchendaele on 9th October even though the wind and rain had now developed into a gale force storm. He appears to be quite unaware of the appalling conditions on the front or that the wire has not been cut and the Germans have replaced their soldiers with fresh support troops in their relatively dry pillboxes. His reason for persisting is to allow his troops to winter on the ridge, without the Germans overlooking them, and with drier conditions once the front line is out of the swamp. The Australians attack and at Augustus Wood, near the Tyne Cot, Captain Clarence Jeffries organizes a party and attacks a pillbox, capturing four machine guns and 35 prisoners. He leads another charge on the next blockhouse where he is killed by machinegun fire. He will be awarded the posthumous Victoria Cross. Incredibly, and mainly because of the valour of Captain Jeffries, 20 men reach the rubble that used to be Passchendaele church. Unfortunately the British troops on their right are unable to support them and the Australians are forced to retreat all the way back to the mud holes that had been their front line. By now, their artillery is running out of ammunition and their shells are burying themselves in the liquid mud and expending themselves relatively harmlessly in a cloud of steam and a fountain of water. 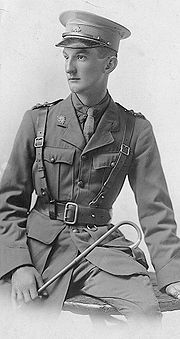 Major John Edward Blakemore MC (Royal Field Artillery) is killed in action at age 36. He is the son of the late Councillor Edwin Blakemore. Captain Lawrence Henry Jones (East Surrey Regiment) is killed at age 25. He is the son of Canon Gustavus John Jones Rector of Crayford. Second Lieutenant Reginald Fitzgerald Sargent (Irish Regiment attached Machine Gun Corps) is killed at age 35. He is the son of the Reverend John Fitzgerald Sargent Vicar of Saltcombe. Private Michael Logan (Australian Infantry) is killed in action at age 34. His nephew will be killed in May 1918. Private Ernest Edward Parker (Devonshire Regiment) is killed in the Ypres area at age 21. His brother will be killed in October 1918. Private John Edmunds (Duke of Cornwall’s Light Infantry) dies of wounds at age 30. His two brothers lost their lives last year. Private David Phillpott MM (East Kent Regiment) is killed at age 31 becoming the middle of three brothers to lose their lives in the Great War. Private Christopher James Alexander (West Surrey Regiment) dies of wounds received the previous day at age 30. He is a well known ornithologist.